Refreshing (and healthy) Asian coleslaw – with many twists! | Hey Bernice! The salad has a very fresh flavour (it is not mayonnaise based like the traditional coleslaw) with beautiful herbal aromas, it is ridiculously healthy and a great way to sneak some vegies into those that usually push them to the slide! (boyfriends, husbands and kids!). But wait – there’s more… it is super easy to make, and doesn’t require any culinary ability. What is brilliant about this recipe… if you don’t like prawns, make it with chicken thighs, if you hate chicken thighs (like me! ), make it with chicken or pork mince – it is completely flexible. Enough sales pitch chit chat, here’s the recipe… I must credit the cook book Green Mangoes and Lemongrass by Wendy Hutton for the bulk of this recipe. I have a habit of changing recipes, so it is not identical to hers. Lay out the sliced onion on a plate or chopping board and sprinkle with the salt. Rub with your fingers and set aside for 30 minutes. To prepare the dressing mix all the ingredients in a bowl, then set aside for the flavours to blend. 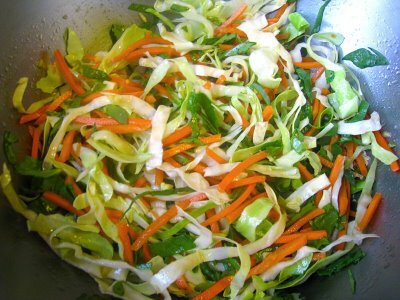 Before serving place the cabbage, carrot and herbs in a large bowl. Rinse the salt off the onion then squeeze dry and add to the bowl. Add the meat or seafood of choice, ground pepper and the dressing – mixing all ingredients well. If serving as an entrée or main, place portions of the salad in bowls or on plates, garnish with mint, coriander or deep fried Spring onions/shalots. Serve as a salad/side – Perfect at a barbeque as a salad option, or to serve with a meal on a plate. If you are doing this do not add any meat or seafood to the salad. To add some extra interest, place some Changs Crispy noodles into the salad to add some crunch (you can buy them in the Asian/noodle section of the supermarket). Serve in lettuce cups -Making a great entrée or side salad by serving the coleslaw in iceberg lettuce cups. If you can’t be bothered making it to see if you like it, my suggestion would be to try it first in a Vietnamese restaurant to see if you like the flavours. As my sister and I would say as kids (and still occasionally now!) – Yum Yum, pigs bum! I made this tonight for dinner with pork mince. Delicious. And I’ve never rinsed onion before, but the salting was perfect. Thanks!